much to my delight, this little earth retro eight pack of fat quarters was delivered to me yesterday, a "thinking about you" gift from my sister, who recently took a sewing class, too, and picked this out for me at the shop where she received instruction. it's so sweet. and so good to slow down, send and receive a little mail love, in this online, instant communication techno fad world. give a little love. receive a little love. this weekend. it's all good. peace out! How great to get such a wonderful gift in the mail! 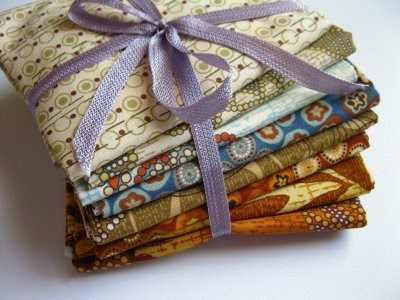 Can't wait to see all the goodies you'll sew up with those pretty fabrics. Happy weekend to you too!!! I love getting fabric from my sister, too! This reminds me that I've been lax in sending her any myself. what a great gift and surprise for you. can't wait to see what you will be making. give a little, receive a little. it is all so so good! such earthy tones. love it. That is a great sister! Have a terrific weekend! What is your 365? Do you have another blog that I don't know about? Such pretty earthy fabrics- have some fun with them! WHat a nice sister! Cannot wait to see what you come up with for these. Mail love is ALWAYS good!